Competitors will tap machine learning and other techniques to create their bots. AI may have trounced humanity in the ancient game of Go, but it remains untested in countless other gaming arenas. Case in point: Doom, which, it turns out, will be the technology’s next big challenge. 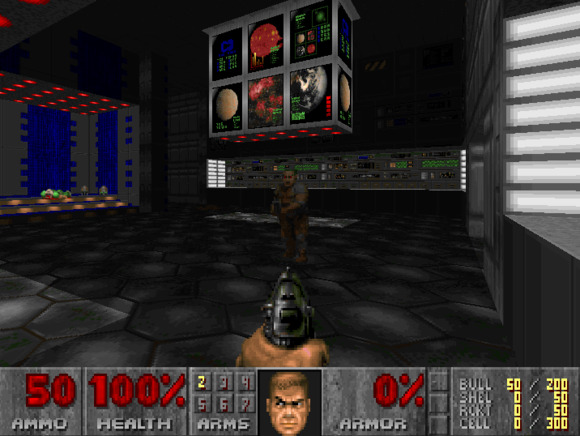 Launched in 1993, Doom is widely considered a landmark title in the video-game industry for popularizing the first-person shooter genre. Now, artificial-intelligence researchers will have a chance to pit their creations against others in a contest based on the game at the IEEE Computational Intelligence and Games conference in September. To create their bots, competitors in the Visual Doom AI competition will use ViZDoom, a platform based on the game that’s used for research in machine learning. Gaming AI bots typically have access to the game’s internal data, including maps, locations of objects, and positions of characters, but the bots in this contest will have only the raw visual input a human would. Participants in the contest are allowed to use any technique to develop their bots, but machine-learning methods are encouraged because that’s the focus of the ViZDoom platform. There will be two competition tracks, according to the contest’s website. The first is a limited deathmatch on a known map; in that case, rocket launchers are the only weapon available, though agents can gather medikits and ammo as well. The second track will be a full deathmatch on three unknown maps; two different maps will be provided for training. Either way, each AI bot will be run on a separate machine with just a single CPU and GPU at its disposal. Bots will battle the other competitors for 10 minutes on a single map. Each game will be repeated 12 times for the limited deathmatch competition and four times for the full one. In each case, the bot with the most “frags”—or opponents killed—wins. Results of the contest will be announced in late September. All submissions will be published after the competition is over. Researchers are increasingly using games to test their AI, including also Minecraft. The strategy game StarCraft is widely considered a particularly daunting challenge.